Rotary Vacuum Drum Filter (RVDF) is one of the most prevalent practices in the industry to dewater all kinds of sludge at low capital cost. Even though these units consume higher power due to deployment of Vacuum Pump, these units are still preferred in given situations in view of their low cost maintenance. These units can be supplied in various sizes upto 1000 sq.ft. Filtration area each unit. Depending upon the type of sludge, the dewatered solid discharge mechanism can be in different configurations e.g. 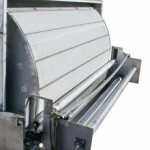 Belt Discharge, Knife Discharge, String Discharge etc. we manufacture filter belts for all these kinds of belt filters. To know about the Filter Belt in detail Click Here!